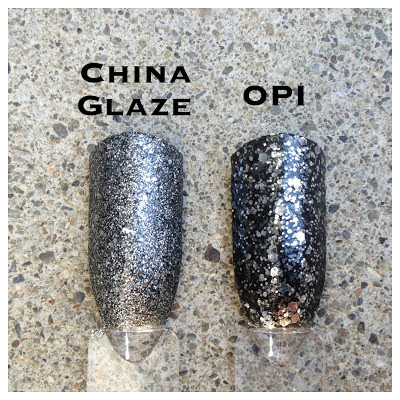 What I Blog About When I Blog About Books: Polish Comparison: China Glaze "Tinsel Town" vs. OPI "Metallic 4 Life"
Polish Comparison: China Glaze "Tinsel Town" vs. OPI "Metallic 4 Life"
I do these at a fairly slow rate. But I figure there are so many nail bloggers serving as amazing polish comparing resources that my promptness on this matter isn't an utmost necessity. For today's comparison I have two glitters, China Glaze's "Tinsel Town" from their 2012 Holiday collection and OPI's "Metallic 4 Life" from their Nicki Minaj collection. I'm mostly doing this comparison to debunk the claim my friend, dafinepolish, made that these two polishes are a lot a like. Hopefully it will be helpful to others who think the same as well. 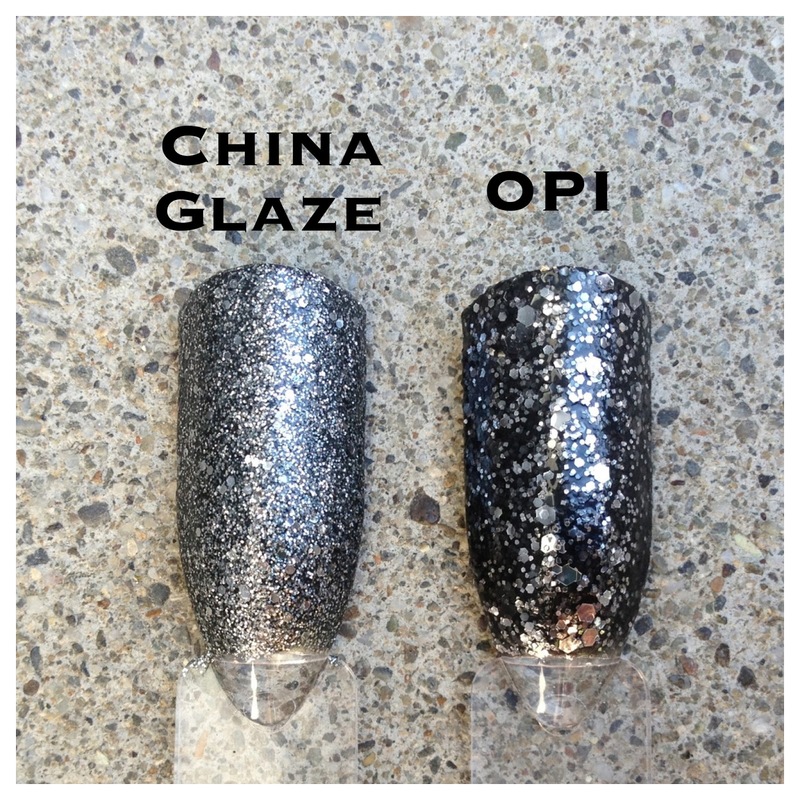 China Glaze's "Tinsel Town" is full-glitter charcoal glitter with a blue-undertone. 2 coats for opacity. More photos and full review here. 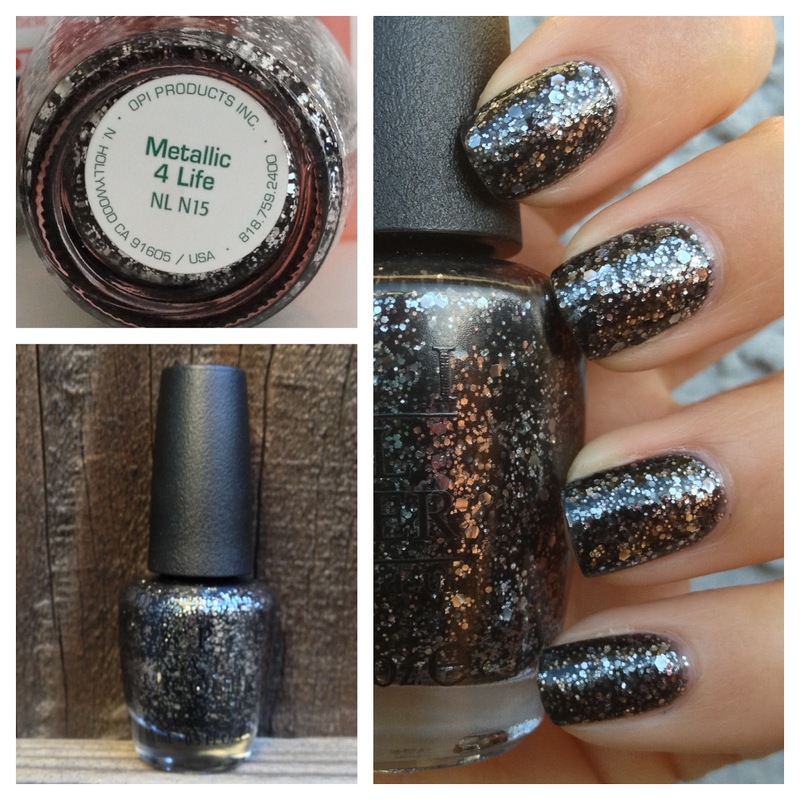 OPI's "Metallic 4 Life" is a chunky silver glitter in a jelly black base. I recommend using a black base with this polish. More photos and full review here. Here's a bottle shot. A little blurry. But you can already see some clear differences between the two. 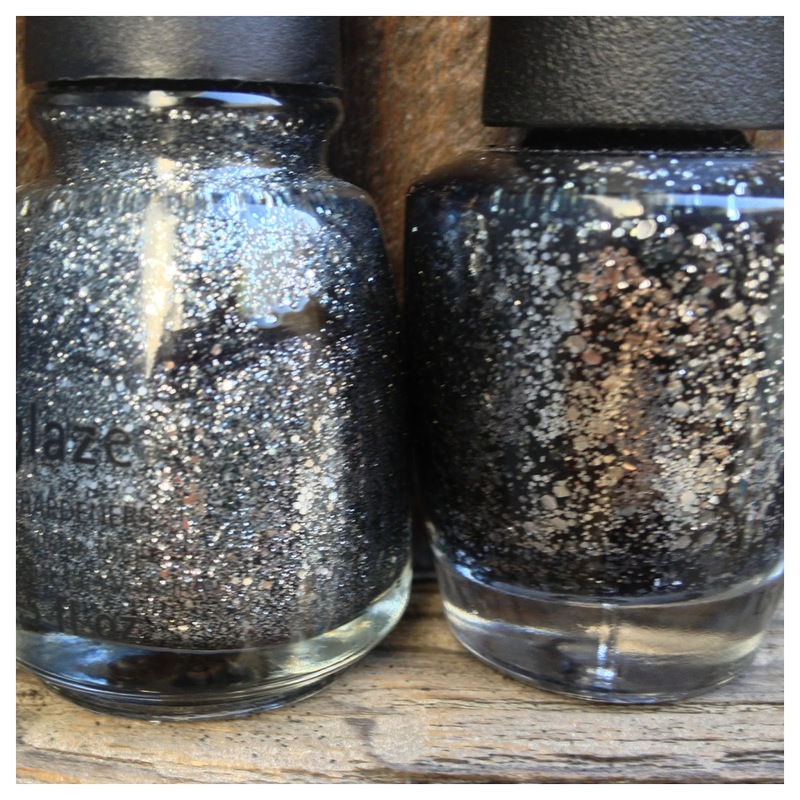 "Tinsel Town" is all one tone where as "Metallic 4 Life" is clearly silver glitter mixed in a black base. And here are the final swatches. The color, finish, and overall look of these polishes are very different. Yes, they both have a silver quality to them, but that alone hardly makes them similar. As far as which polish I prefer, I think they are so vastly different that I would say I like them equally, just for different occasions/moods. "Metallic 4 Life" is better for when I want to sport a darker look but don't want to go for a flat dark manicure. And "Tinsel Town" is better when I'm in the mood for a lot more glitter. 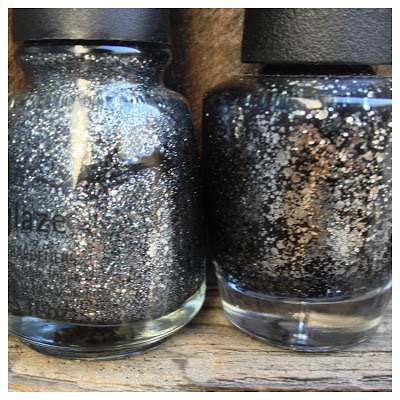 I like the two-glitters in Metallic 4 Life, but I also love the uniformity in "Tinsel Town" Ahhhhh!!!!!!!!!!! ...I will probably own both soon.